Early this month, I took part in the memorial ceremonies for my aunt, Khandro Tsering Chödrön. Khandro was universally respected, loved and revered as one of the greatest practitioners of Tibetan Buddhism in recent times, and an inspiration and source of blessings to Buddhist practitioners everywhere. In the days before she passed away, eminent Tibetan Buddhist teachers came to visit her, as messages and tributes poured in from around the world, and ceremonies were conducted in her honor at monasteries in Tibet, India, Nepal and Bhutan. The memorial ceremonies at Lerab Ling, our monastery in southern France, were attended by nearly two thousand people, including some of the foremost masters of the Tibetan tradition. As I was growing up as a young boy in Tibet, Khandro cared for me as if I were her own child. But even more significantly, she was one of my most important teachers. No one demonstrated more clearly than Khandro what years of the deepest devotion to spiritual practice can create out of the human spirit. 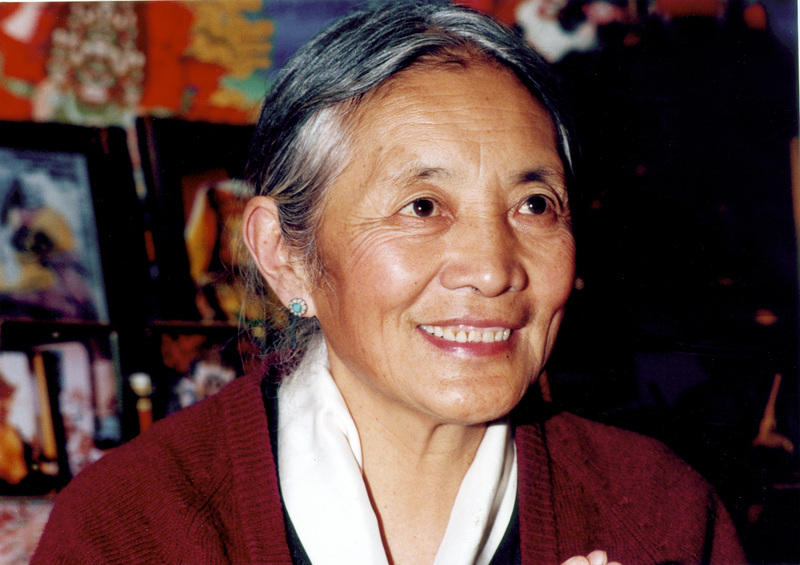 Her humility and beauty of heart, and the shining simplicity, modesty, and lucid, tender wisdom of her presence were recognized by all Tibetans, even though she herself tried as far as possible to remain in the background, never pushing herself forward, but living the hidden, austere life of an ancient contemplative. Khandro was the spiritual wife of my master, Jamyang Khyentse Chökyi Lodrö, who was among the most respected and influential Tibetan Buddhist teachers of the last century. Their extraordinary relationship was the inspiration of her entire life, transforming her from a very beautiful and slightly rebellious young woman into the radiant, enlightened presence that other great masters, including His Holiness the Dalai Lama and Dilgo Khyentse Rinpoche, held in the highest regard. For eleven years, Khandro served as Jamyang Khyentse’s constant companion, as he conferred countless transmissions and teachings to the next generation of Tibetan masters, many of whom went on later to teach in North America and Europe. He gave Khandro all the teachings, and trained her and inspired her to practice. Her questions to him would often take the form of songs, and he would write songs back to her, often in a playful and teasing manner. In 1955, they traveled from Eastern to Central Tibet with a group that included my mother, myself and other members of our family. We then made our way towards India and to the kingdom of Sikkim, where we stayed in the capital, Gangtok, as guests of the king. It was there that Jamyang Khyentse passed away in 1959, just months after the fall of Tibet. Khandro demonstrated her undying devotion to the teachings and to Jamyang Khyentse by continuing to live in Sikkim for many years afterwards and carrying on her clear, independent life, devoted to constant prayer. She read the whole Word of the Buddha and hundreds of volumes of commentaries, slowly, word by word. In short, the life she lived was exemplary, characterized by a down-to-earth, humble simplicity, a no-nonsense approach and a selfless kindness towards everyone; she was the perfect model of a great Buddhist practitioner, and it is for this more than anything else that she was held in such high regard. Khandro travelled to Europe and America a number of times at my request, and in 2006 she came to live at Lerab Ling. It was there that she passed away in May this year. In the modern world, when a famous or highly respected figure dies, we are always quick to speculate about their legacy. In Khandro’s case, her legacy was, quite simply, her presence itself. No one who was fortunate enough to have met her will forget the atmosphere that surrounded her. Because her life was such a moving and exquisite example of devotion to spiritual practice, she naturally embodied the heart of the Buddha’s teachings, and radiated their warmth to others in a most powerful and tangible way. Khandro did not teach formally. In fact, she did not speak a great deal; but what she did say was penetratingly clear and often even prophetic. To listen to her fervent and blissful chanting, or to practice with her, was to be inspired to the depths of your being. Even to walk with her, or shop, or simply sit with her was to bathe in the powerful, quiet happiness of her presence. For me, Khandro’s wisdom and the wisdom of my master Jamyang Khyentse were one and the same. In fact, all of Jamyang Khyentse’s disciples saw her as being no different from him, and many of them would come to pay their respects to her with such devotion, especially when she fell ill, and before she passed away. Dilgo Khyentse Rinpoche–one of Jamyang Khyentse’s closest students, and a renowned Tibetan master in his own right–looked to her as a ‘spiritual mother’. Whenever he used to see Khandro, he would take her hand and tenderly caress it, and then quickly place it on his head. On account of Khandro’s humility, he knew that this playful trick was the only way he could ever get her to bless him. In her later years, even when it became obvious that Khandro had attained an extremely high level of spiritual realization, she never claimed to have any special understanding. But there was something quite different and extraordinary about her; she was completely fearless, and her sense of humor became even more profound and acute. Although she spoke less and less towards the end of her life, it seemed to me that with her incredible humor, she was always giving us an important teaching about the ironies of life. Perhaps we don’t need to take everything so seriously, she seemed to say. Even this whole cycle of existence, birth and death that Buddhists call ‘samsara’ looks quite ridiculous when viewed from an enlightened perspective. In truth, for me there was no one more precious than Khandro in the whole world, and no one I loved more deeply. Because she was so retiring, and because her greatness was in her ordinariness, often only those with real insight saw who she was. And although she was too humble to give blessings to others, many great masters have said again and again that the very fact that she came to live and die at Lerab Ling was itself the greatest blessing of all. I feel too that, in some sense, her presence in the West was a confirmation that the rich wisdom tradition of Tibet has taken root here, and will continue to make a meaningful contribution to the welfare of society and of people in the modern world. You can read more about Khandro and Jamyang Khyentse in the Tibetan Book of Living and Dying.